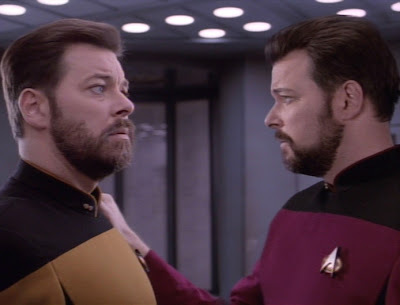 When the Enterprise crew visits Nervala IV in order to recover scientific data that had been lost in a storm eight years ago, Commander Riker experiences the shock of a lifetime when he discovers his perfect doppelganger living on the planet, having been castaway for those eight years. 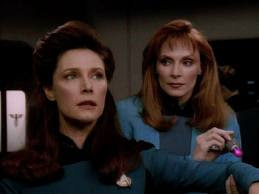 The results of this discovery throw many things into doubt for him, not the least of which is his relationship with Counselor Troi, his erstwhile Imzadi. 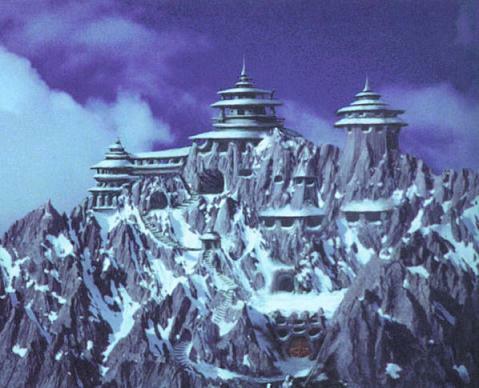 Worf takes a leave of absence from the Enterprise to visit the Klingon monastery at Boreth. His experience with the Klingon colony on Caraya has left him questioning how sincerely he held the beliefs he was trying to teach the young Klingons. After a few weeks, Worf has not found any answers and is preparing to leave when a Klingon appears before him in a cave, claiming to be the mythic Kahless, returned to the world as he foretold more than a millennium ago. Is this man really who he says he is? What impact will this have for the Klingon Empire? Jeez. Couldn't he have pointed to Risa when he left? When Dr. Crusher works to assist a Ferengi scientist with his research, she is drawn into a web of intrigue surrounding his invention when the experiment goes fatally wrong. As scientists fall under suspicion for the deaths of their colleagues, Crusher must wrestle with her sense of medical ethics, as well as the disparate personalities of the suspects. 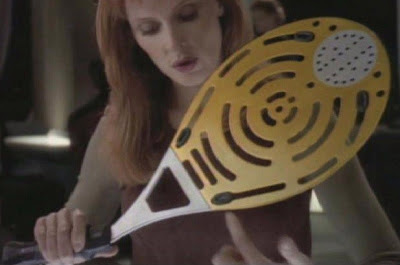 Dr. Crusher unveils the Spank-O-Tron 9000 for Guinan's personal enjoyment. Commander Riker is performing the lead in Doctor Crusher's latest production aboard the Enterprise. Called "Frame of Mind," it's a pyschological thriller about an inmate in an insane asylum. As the play is nearing its opening, Riker is assigned to a dangerous rescue mission. 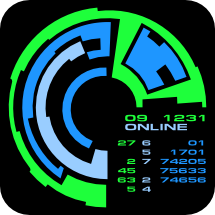 While preparing for both the play and mission, aspects of the one seem to sneak into the other. Initially, he dismisses it as stress, but suddenly he finds himself in the apparently real asylum of the play, while his life aboard the Enterprise is deemed a fictional delusion. 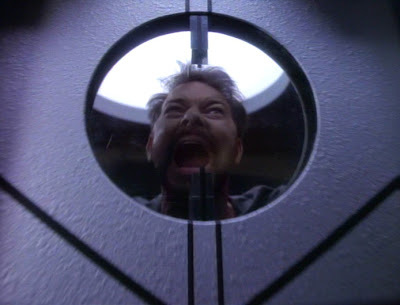 Nothing makes sense, and Riker begins to question his own sanity. What's real? What's not? Can he tell the difference any more? Caught in a Trek-themed fantasy world. We can relate, Frakesy. When Captain Picard is approached by a mentor from his past, he is swept up into a galaxy-spanning mystery over the very basis of humanoid life. But he must carefully negotiate with his rivals for the prize, the Klingons and the Cardassians. He must also balance his responsibility to Starfleet with his desire to fulfill the dream of his intellectual father figure. Unfortunately, the Chia have all long since died. Captain Picard begins a romance with Nella Daren, the new head of Stellar Sciences. They bond of a shared love of playing music, and Nella begins to draw Picard out from his normally reserved demeanor. Picard is understandably worried about the pitfalls of dating someone under his command, but seems prepared to work through them. Matters are complicated with a dangerous firestom threatens a nearby colony, and Picard must order Daren to to risk her life to save the colony. While the Enterprise gets scrubbed of built up baryon particles, the crew enjoys the hospitality of the planetary base below. 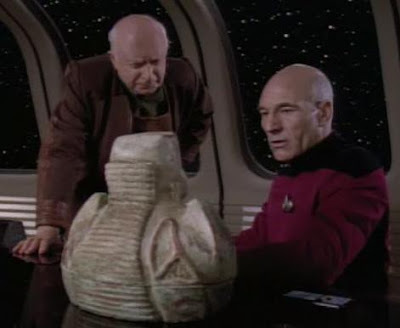 But when Picard returns to the ship to retrieve a personal item, he is shocked to discover a plot to steal a dangerous byproduct from the ship's engines. It is up to him to stop it, at whatever cost. 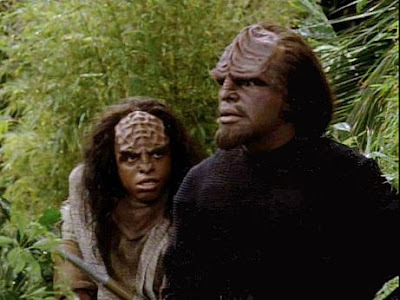 While his father did die at Khitomer, Worf finds other surviving Klingons at a hidden colony. They were captured and held prisoner - voluntarily. To protect their families' honor, they stayed so no one would know they had been captured. Further, Worf discovers that the Klingons here have started new families, and that the Klingon children know nothing of their heritage, believing their parents came to the planet to escape war with the Romulans. 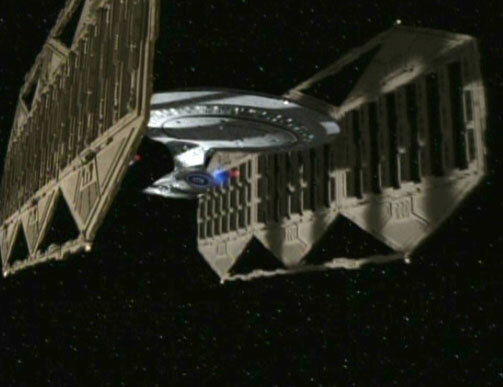 Will Worf be able to leave? What effect with will his presence have on the colony? A real Klingon does not wear deodorant, Toq. Inhale my musky odors and rejoice! 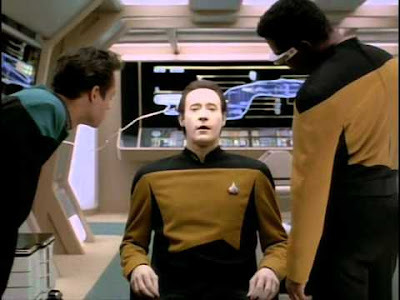 When Commander Data is hit by an errant energy beam, he experiences strange visions. Meanwhile, Worf is approached by a mysterious stranger trying to sell information about his father, Mogh.